Wigglehop Movies and Showtimes is a handy, functional universal app for iPhone and iPad for selecting and coordinating a trip to the movies. Using location services, all of your movie, theater, and time options are at your fingertips at a moment’s notice. To get started with the Wigglehop iPhone and iPad app, you are directed to touch the arrow to activate location services. The list of nearby theaters appears in seconds. The closest movie theater tops the list. Then, you select the theaters you would consider attending. After you select your theaters, then you can check out movie selections by touching the screen or swiping to the next page. When you select the movie, a brief description, rating, and length of show appears. You can select multiple movies to move to the next step–checking out showtimes. You have the opportunity to look at showtimes for the current day, as well as the next three days. Once you have selected the day, then you swipe to the showtimes screen. Again, on the showtimes screen, you can sort via morning, day, evening, and night. After you make your selection, then you can coordinate meeting friends and suggesting options to loved ones–or potential loved ones. The nuanced integration of social networking is the interesting perspective Wigglehop Movies and Showtimes brings to the iTunes store. With one touch you have the opportunity to connect and plan with your friends via Facebook, Twitter, email, or text message. The pertinent details are in the text, and there is a link to the online information at wigglehop.com. You can, of course, edit and enhance the text, but the default hits the important details–movie name, time, date, and url. 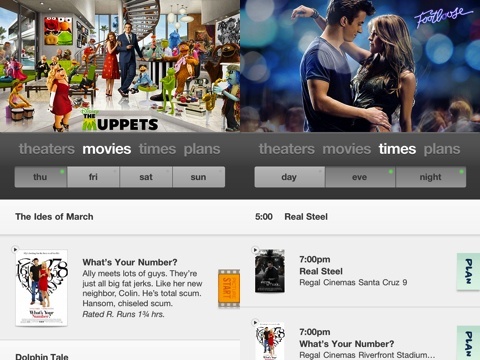 The Wigglehop Movies and Showtimes iPhone and iPad app is free, but be prepared for large ads. By large ads, I mean roughly 1/3 of the device’s screen. If you scroll the ad up and out of the screen, the main content will fill the screen. The movie business is a marketing beast, so in many ways, you expect ads. For such a well-designed and helpful iPhone and iPad app, an ad-free version of Wigglehop would certainly be a hit with users. For movie lovers or if you are wooing a movie lover, then you’ll want to check out the excellent Wigglehop Movies and Showtimes universal download. AppSafari review of Wigglehop Movies and Showtimes with Facebook, Twitter, SMS and Email was written by Jenni Ward on February 10th, 2012 and categorized under App Store, Free, iPad apps, Local, Movies, Universal. Page viewed 5607 times, 1 so far today. Need help on using these apps? Please read the Help Page. That’s cool. I’m going to have to download that app. I’m a big movie buff so I’m sure it’ll come in handy. I love how there’s always so many great entertainment apps coming out for the iPad, but my favorite is still from my employer, DISH. There Dish Remote Access app is just unbelievably convenient. Combined with the Sling Adapter I have hooked up to my receiver, DRA allows me to stream all of my live channels and DVR content straight to my iPad. It’s cool for everyone but especially those who travel a lot or live an on-the-go lifestyle, can benefit from having all their programming available at their fingertips.